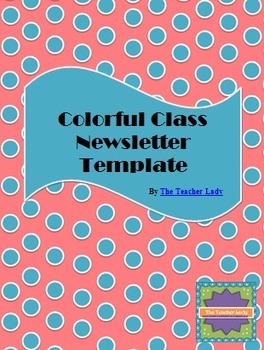 This colorful and attractive template will make writing your weekly newsletter a breeze! It is set up as a series of text boxes entitled "What's Happening in Class This Week," "Mark Your Calendar," "A Note from Your Teacher," and "Student News." All you need to do is type your info into the boxes and print it out or e-mail it home! I'm not including a preview because what you will see in the thumbnail is exactly what you will get, as the file is only one page. 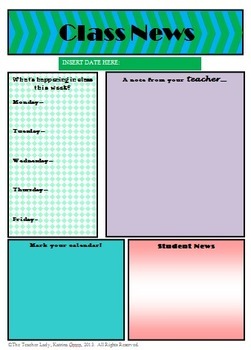 Parents and students alike will appreciate receiving your new and improved weekly bulletin!